I used to favor white over black sand beaches. 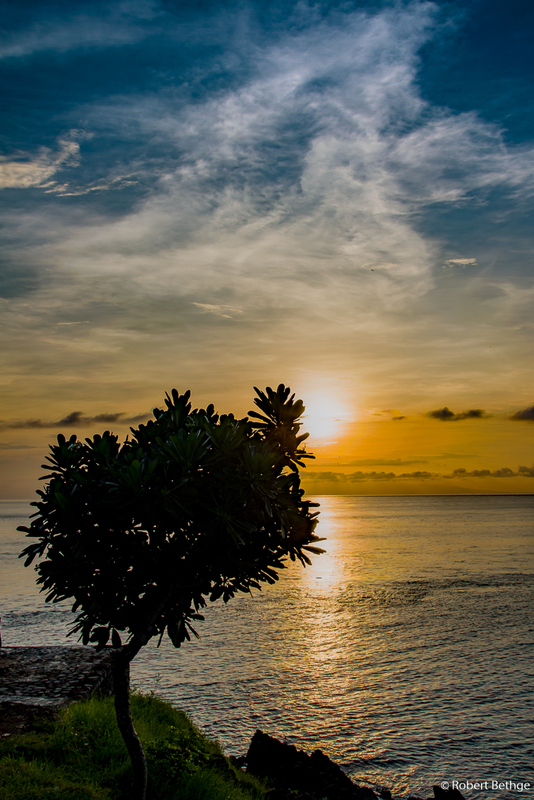 That has changed on Bali, where I discovered the beauty and fascination of beaches pitch black like the night. The black sand beaches from close up sometimes look like the night skies full of stars. The skies on the other hand are full of color and present quite some drama. 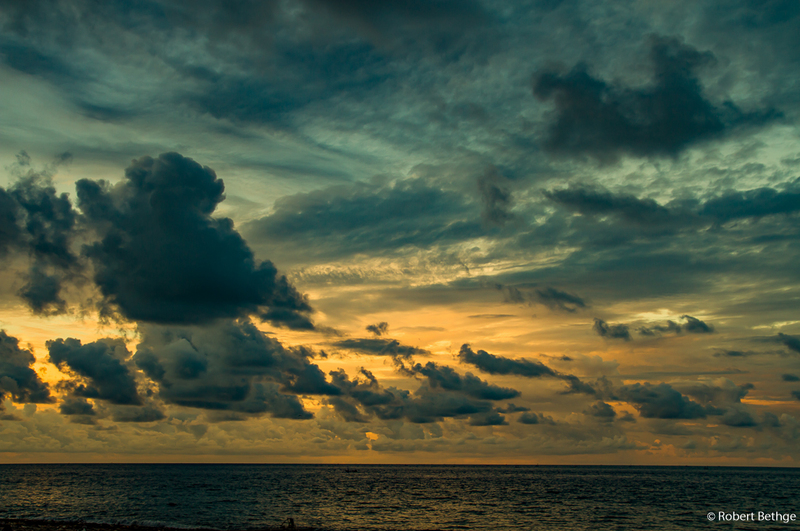 Even when still on the plane right before landing on Bali I was fascinated by the skies over Bali. The clouds seem to form fantasy landscapes on their own. And once my stay had started I was not disappointed: Especially during sunrise and sunset, it looked as if the clouds were continuously sending new fleets of ships from the horizon. 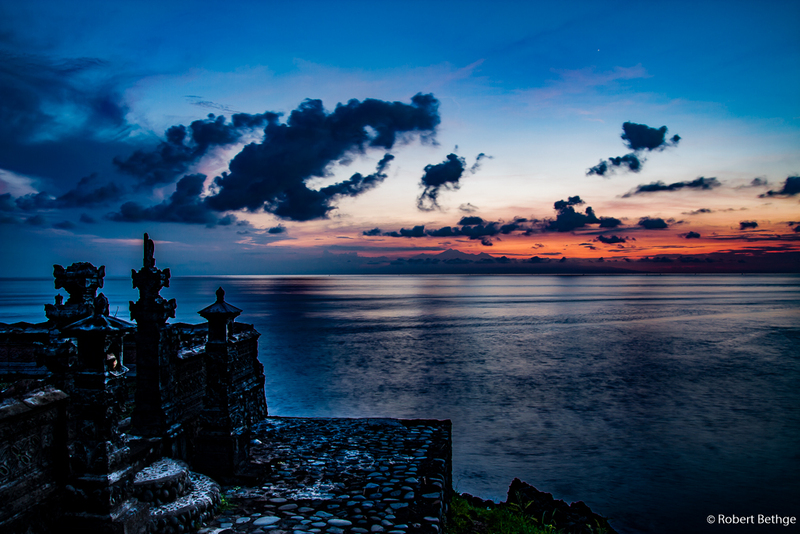 The black sand beaches that are common in the east of Bali were the perfect backdrop for the theater play given by the skies. The ocean, calm and quiet, seemingly content with doing nothing but serving as a mirror for the impressing game of colors. Every morning I went to the beach nearby our “jungle lodge” to swim in the ocean. Rarely did I see another person on that beautiful, wild beach. 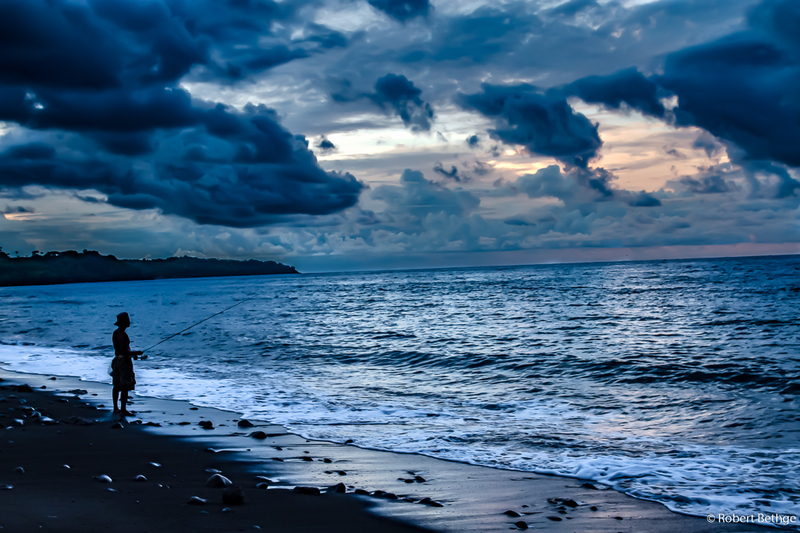 On one of our evening strolls along the beach, I wanted to take a picture of the black sand beach, when out of nothing two beautiful women walked into the picture. You might have noticed that my pictures usually don’t show people, and indeed I initially thought “damn, these chicks are ruining my picture now”. But when I looked at the image at home, I noticed how these two ladies made the picture all the more beautiful. Look at the featured image of this article to see whether you agree. 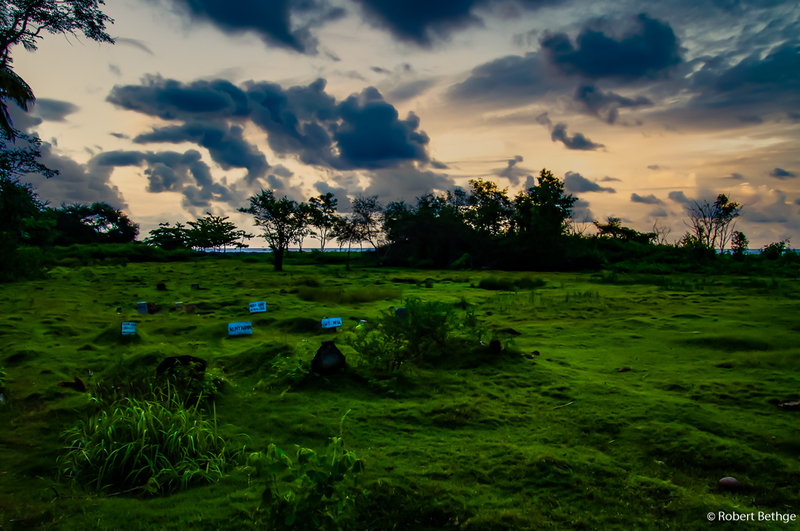 Right next to our beach, there was a little, wild graveyard. Not for animals, not for cars, for PEOPLE. Apparently, on Bali, people, once dead, are burned right at the beach, at something we would call a bonfire. The relatives and friends stand around the fire and watch the burning corpse, even poking at it with long sticks to make sure it burns well. 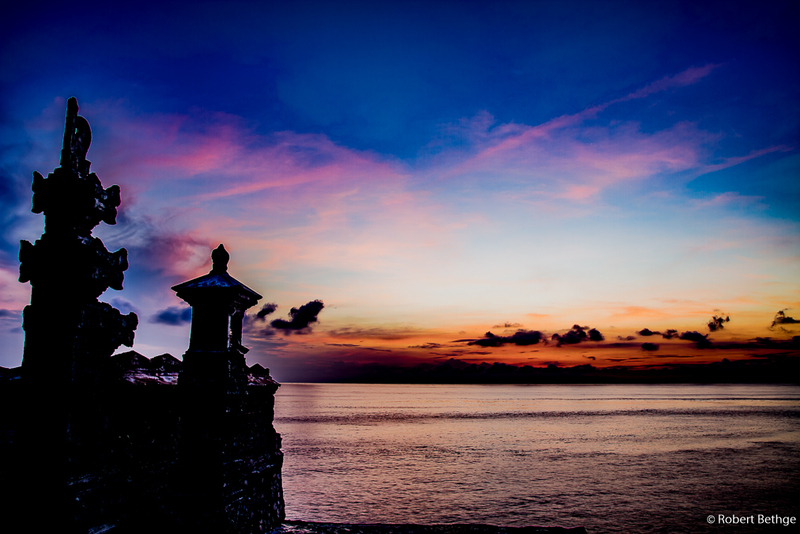 A scary thought for us, but Balinese have a somewhat lighter attitude to death, thinking of it as normal process of nature. This wild graveyard had a certain atmosphere about it…you almost expected Graf Dracula to step out of one of the graves at midnight. 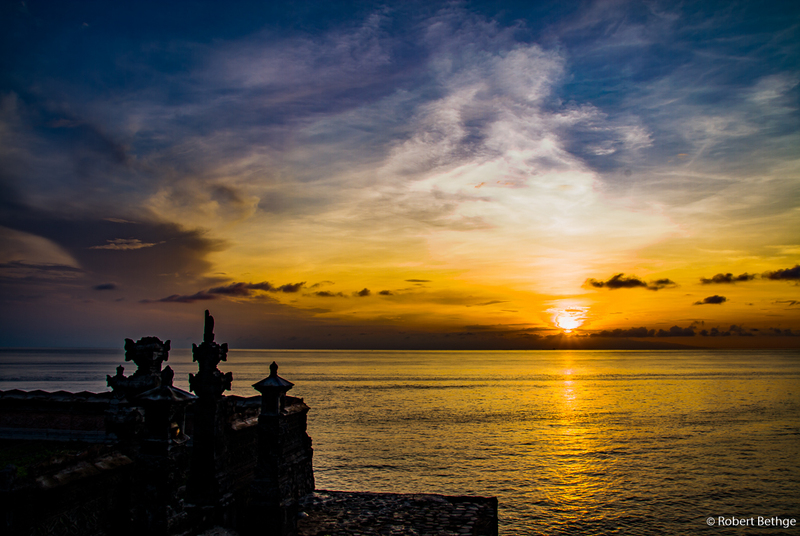 One day I got up at 5:30 to take the motorcycle to the eastern tip of Bali, to await the sunrise there. There was a little temple there, a perfect backdrop for my photos. Boy, what a spectacle! Here are some photos from that morning. Look how the colors and the mood changes as the sun rises!